In today’s world of social media, where everyone is sharing seemingly everything, do we still need genealogy societies? That’s the question I posed to Josh Taylor, host of Genealogy Roadshow, president of the Federation of Genealogical Societies, and new president of the New York Genealogical & Biographical Society. 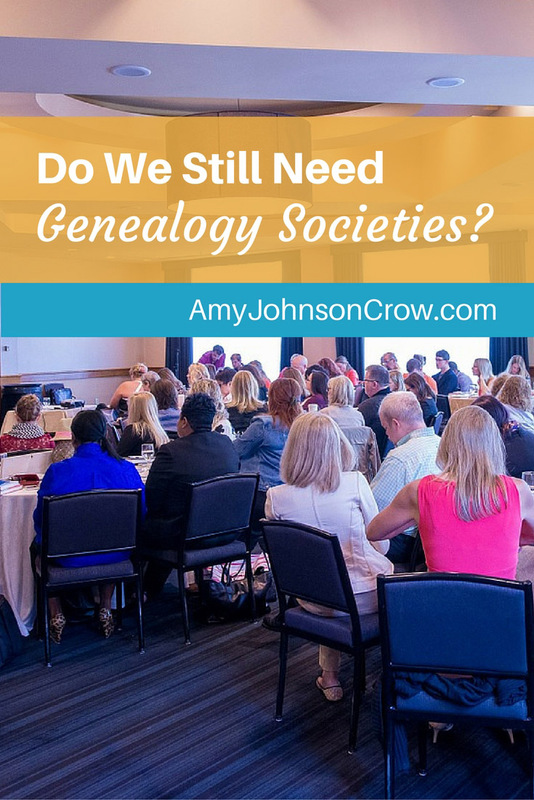 Is there still a need for genealogy societies today? Let me know your thoughts in the comments below. 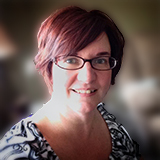 This entry was posted in societies and tagged interviews, Josh Taylor, RootsTech, societies by Amy Johnson Crow. Bookmark the permalink. Yes, good question Amy. I’ve recently let my membership lapse for two organisations in the UK (one being a local family history society) because they were too static. It was just “me and them” with no sharing, collaboration, or networking. Being given their newsletter and Web site didn’t cut it for me. Interestingly, I was told that I could not contact other members because they had to honour their privacy. Maybe there are people that don’t want to be seen/heard, but I believe they are a minority, and participation in a group/community/forum/mailing-list is optional anyway. That’s sad, Tony. I’ve always thought genealogy and family history is about collaboration (or at least talking with each other). How sad that the society you mentioned isn’t fostering that. Society is becoming more and more “share oriented,” at least in terms of leisure activities. (Think about Instagram — so many food pictures!) I think that societies that don’t figure out a way to foster sharing and collaboration are dooming themselves to failure. It’s even more sad because I’d offered to implement some sort of online group where the members could communicate, Amy. The excuse about privacy was part of their argument in turning me down. Would it be possible to do Facebook page for people researching the UK? I just checked and there was not one for Radnorshire Wales where my ancestors lived. You can create a Facebook group for anything you’d like! There are several groups already that are devoted to Wales, though none specifically for Radnorshire. You might want to check out Katherine Willson’s genealogy on Facebook list: http://socialmediagenealogy.com/genealogy-on-facebook-list/ Click to download the PDF; in the current version, the Welsh groups are on page 121. 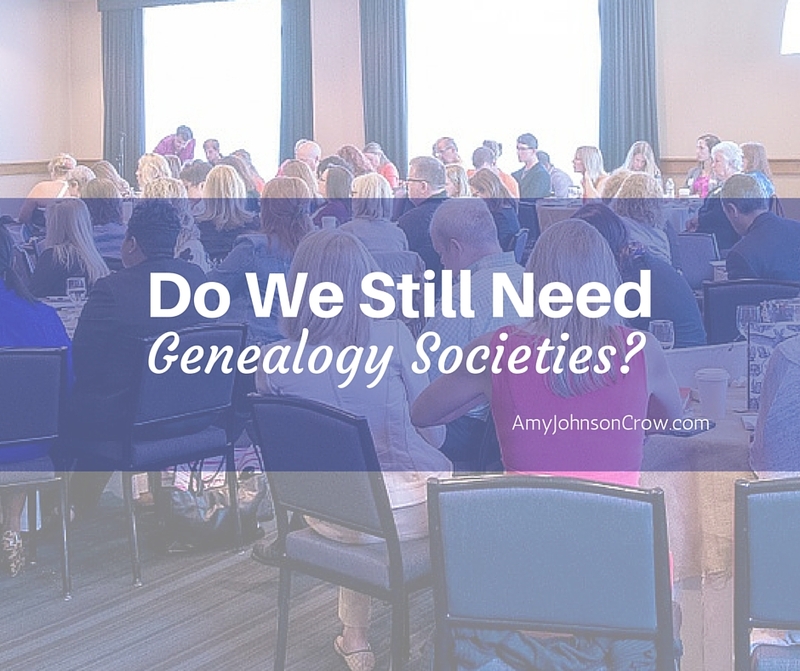 Yes, we still need genealogy societies. All of us do not go on social media sites like face book and tritter. The societies have such great information for all of us. I hope they never disappear. I hope we always need genealogy societies! Personally, I use them regularly as a source of “the best people in the area” to ask questions of. How would I ever find the little known resources within the county or town without them! The gigantic conferences that provide personal contact among acquaintances for an hour or two per year do not provide the nurturing environment of a smaller group, such as local societies or chapters of national ones. The speaker before an audience of hundreds or thousands cannot respond to individuals’ questions or personal stumbling-blocks. While the growing number of webinars also have feedback limitations, they are more likely to home in on participants’ concerns, and their sponsors can improve presentations or expand subject matter accordingly. The huge conferences have limited ability to do this. Amy, this is quite a valid question. Personally, I feel they are just as vital as ever, but they are not attracting new members, nor those that are younger. Most everyone feels that the internet is the way to go. 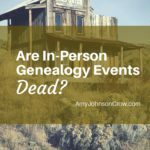 And, though that is absolute part of genealogy research, it certainly is not all. I recently attended the genealogy society meeting here in my own county. I don’t have a single ancestor that was from this county, but the easy and casual atmosphere, the questions that were brought up and answered by another, the second meeting that followed containing computer help — all of these serve to keep me fresh. I feel they are very important. The hard part comes in convincing others. You and I both know, Miss Peggy, how valuable societies are. I just wish they would stop thinking of themselves as the best kept secret in genealogy! They need to blow their own horns — loudly!! This is a wonderful question and this is something that we talk about all the time. A Genealogical Society is part of the fabric of the Family History community. We not only promote networking, monthly emails and opportunities for members to be involved in local projects but we encourage Preservation, Education and Advocacy at the local level. Our local Branch has presented at Town Councils and taught at Local Libraries and been the “Boots on the Ground” for those from a distance researching. We have researched and rediscovered cemeteries and worked with the local radio, TV and newspapers to promote our passion. Finally we have developed working relationships with other organizations to promote family history. Without this group – How could this be done at a local level if we don’t have Genealogical Societies? Your group sounds like it’s doing a great job! I think so too. I joined different groups for counties where my family lived in case I can connect with descendants. Joined local group because first meeting I attended was the group meeting to talk about each others brick walls offering help on what people could check. It was so fun to be with group of people who also find genealogy so fun. This certainly is two halves of the coin. The best societies keep in touch with their membership (not just when it is renewal time),and they offer the member a reason for being part of the society. The best members volunteer – whether that is for a project or task or a position. It is hard to be a great society if you don’t have volunteer members who step up and do their part AND you don’t willingly update your efforts to change with the times (static is not good for anyone or anything). There is give and take on both sides and that is what makes societies and their members work.. Sadly I think some societies struggle with the concept of change and inclusiveness AND many members struggle with the concept of giving back and not starting or remaining at the top (for a variety of reasons). Strong societies are constantly evolving and it is about that human contact and ability to take on those projects that are local in nature and require people working together. It is also about graciousness and be willing to see the potential contributions of others as a good thing. Josh Taylor gave an excellent talk last year at RootsTech/FGS 2015 which should be required listening – volunteers need to be moved around to a variety of positions, no one should lead a group for an extended period of time, volunteers should be acknowledged and thanked and encouraged to take on a role that helps them grow as a person and genealogist. No one “owns” a society – it is about collaboration and being part of a team. Sometimes you can change your attitude with a change of focus – all good thoughts that have stayed with me – now how to implement! As President of the Morris Area Genealogy Society, in Morris County, NJ, I find a genealogy society provides a tremendous support structure for education and camaraderie. I have no ancestors in NJ, but here I am, President of a NJ society. The personal interaction, the knowledge of others (crowdsourcing) to help in where to search, how to search, methodologies, etc. has been tremendous! When I joined about 9 years ago I was a newbie to genealogy. I now have my ancestors back to the 1700s and 1600s, the majority documented and sourced, and was able to qualify for and join the DAR, all with the exceptional assistance of my genealogy society. The Morris Area Genealogy Society (MAGS) strives to provide a general monthly meeting with an informative presentation, and our one-on-one help comes from our Special Interest Groups (SIGs). We have a website that anyone can view with lots of local information; we recently started an open Facebook page; we have Yahoo groups where our SIG members can interact and upload helpful links and files; and we recently began audio recording our general meeting presentations and are in the process of building a website for members to listen to them. The members are anxiously awaiting it going live so they can listen to a meeting they were unable to attend. The internet and society media is great, but there’s nothing like regular personal interaction and collaboration that a society can provide. It seems in this time that we call the “information age” so many well-intentioned people think it is the be-all end-all and that it will last forever, when in fact what we are experiencing today is merely the beginning of the electronic age. It is constantly changing and will always be changing. Not only that but if the Internet and its social media is all there would be, so much inaccuracy would prevail. The day of the demise of genealogical societies would be a sad day because they provide much more than just interaction, they preserve the precious physical material of the ages. What would happen if someone or something would “pull the plug”? Amy, yes we need our genealogy and historical societies. The people that are in them are invaluable to the local community and to researchers from afar. As an archivist I rely on my society members to help with oral histories and stories that they personally know and can relay to a researcher that comes in the archives, usually the society member is only a phone call away! I think what societies need to work on is their delivery, their meetings structure and how they disperse their historical or genealogical information. My local historical society (we don’t have a genealogical society) is very antiquated. I am the youngest member of my society and the next member older than me is in their 70’s. I love them all but sadly they just don’t do anything to promote history or genealogy. I have made suggestions but I am told that the members are not interested. Sigh. Not to sound harsh, but if that society isn’t willing to try anything different, they’ve signed their own death certificate. There’s no such thing as stagnation — it’s actually a slow death. As part of the younger generation that societies purport to want to attract, I don’t have the time for all-day meetings and lunches and more. Maybe an hour meeting, but not taking up my whole Saturday day hours. I’m not retired and have a busy life. I realized after a year or more that my talents were better used elsewhere. Facebook gave me a much more vibrant and welcoming group, and I keep up with it. That is daily interaction- even a little dose once a day is so much better than monolithic structures that forget that people are there to learn in their own way. I wish all societies well, but I hope that they are open to having fun through talking about research cases (personal or professional) and being willing to learn from each other. That is what I thought that I was signing up for, but not what I found. If other groups do that, then kudos. For now, I’ll stick with GAA. We send out a survey to all members in the spring and plan our speakers around the responses. 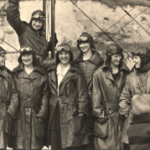 Most of our members believe that our club greatly enhances their genealogical expertise and of course the friendship and networking add icing on the cake. I think we need genealogy societies (especially local) but many need to change in order to stay relevant. I belong to a couple local societies and they are in desperate need of members but are not actively looking to engage the younger audience like myself. I would love to be involved and included with society business but most are unwilling to talk with me because they’ve formed their own exclusive cliques. They have also been slow to engage with new media and new ideas. Even when I’ve gotten involved in society business and suggested new ideas, the ideas are immediately shot down or flat out ignored. Yes, Yes, Yes!! I love to attend meetings of genealogical societies!!! I always glean something from whomever speaks—tidbits of local history, ideas to use when researching, places/sites to research. And I enjoy sharing what I have found and how I go about researching. There are many in my area, but I can’t attend them all. Wish I could. Readung this in 2017. I was wondering if I should join a local group here in MD. Josh’s answer was thought provoking. I think I would need to research the mission statement though to be sure it was a good match for me. Also, do you join the NY society because a,lot of your research is there, even though you live elswhere, so can’t attend meetings.